Beside getting data back from the analytics tools, the fastest way is to actually just talk to your customers directly, either through phone or email. If you can get personal contact information from your users, then that'd be the best scenario. If you can't, then email them (maybe select the more active users), and ask them about their experience. The point here is to ask their experience with using your service, and trying to learn as much as you can. You can use a email marketing tool like MailChimp to send out a feedback asking everybody about questions that can help you learn more about what they think about your product. So that we can improve! This is Edward, and I'm the co-founder and CEO of StartitUp. I want to personally thank you for being a critical part of our startup community and for being an early adopter of StartitUp. Our mission is to build a free startup guide with the most effective and updated action items to help startups build and grow their startups. That being said, we need your help to give us some feedback on how we can improve our platform! 1. Are you an entrepreneur? or are you thinking of becoming one? 2. Are you already working on something? or planning on starting? 3. Are you interested in using StartitUp's Guide to build your startup? or are you just checking it out, out of curiosity? 4. What do you think about the guide and its content, and what would you like us to improve on? 5. Are there additional features that'd you'd suggest us to build? 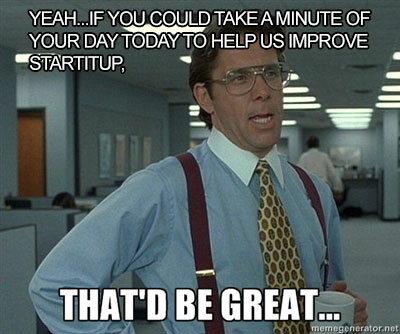 We threw in Bill Lumbergh just to spice things up a little.